The demand for unrealistic salary and benefits are the top cited reasons given by employers on why it is hard for fresh graduates to gain employment these days. “The survey disclosed that 60 per cent of fresh graduates expect a salary of RM 3,500 for their first job while 30 per cent want to be paid as high as RM6,500 in order to live comfortably. This means that there is a gap between what companies are willing to pay and what the candidates want to be paid," he said. Nothing new here, unrealistic salary and poor command of English. What is interesting is the fact that computer / IT specialization has the highest fresh graduate average salary at RM2,795, even higher than engineering, healthcare and accounting / finance. 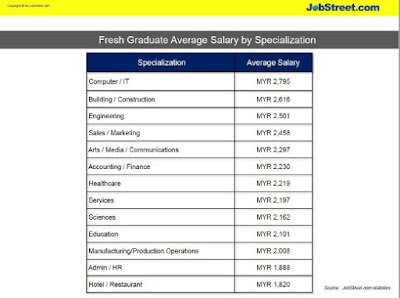 Anecdotal evidences, I know quite some friends from Computer / IT field with starting salary higher than RM4,000. Most of them work in multinational corporations (MNC) like Accenture.